Is this crack cocaine for gamblers? - Winningback | Shopping and Finance Blog, Reclaim your finances today! Derek Webb used to make £5,000 a night as a professional poker player in London and Las Vegas. After 15 years of smoky clubs and casinos, he moved from playing card games to inventing them, and proved so successful that he was able to sell his business for $23m. These days, he finds himself on the other side of the table to the bookmakers. Webb, a significant Liberal Democrat donor and a shareholder in Vegas-based Galaxy Gaming which bought his company, is leading a campaign to curb the use of electronic versions of roulette and blackjack in betting shops. 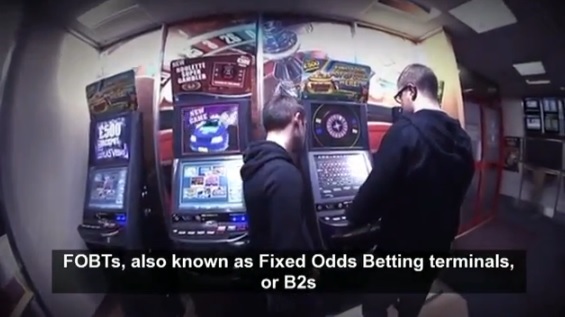 These fixed-odds betting terminals (FOBTs, pronounced Fobtees) have become a political hot potato, with MPs calling for them to be restricted or banned. After bankers, payday lenders and energy companies, bookmakers are in Westminster’s sights. Their gaming machines have been dubbed the crack cocaine of the gambling industry because playing them is said to be highly addictive. Bookmakers are fighting a rearguard action to defend them. “We are on the back foot,” one executive admitted. The problem for the bookies is that the machines form such a large share — about half — of takings in their high street shops. With betting on horse racing in decline, the FOBTs are picking up the slack. In total, customers lost £1.5bn on FOBTs in the year to last March, up from £1.2bn in 2010. The biggest complaint about the machines is that they allow punters to pour in money wildly. Roulette players can stake up to £100 every 20 seconds. In theory, they could lose £18,000 an hour. Bookmakers counter that the average loss is £7.55. Webb, 63, wants to see the maximum stake on FOBTs cut to £2, in line with other gaming machines, such as those found in amusement arcades. He wants casino-style games restricted to the casino. Such a big cut in stake size could be devastating for the bookies. Research from the Association of British Bookmakers (ABB) suggests that the £2 cap would put 7,880 betting shops and more than 39,000 jobs in jeopardy. Stock market analysts have also calculated what such a drastic change would do to the bottom line. Credit Suisse suggests it would cut earnings per share at Ladbrokes by 118%. It forecast a 53% dive for William Hill, which derives a greater share of its earnings from online betting than its main rival. James Ainley, a leisure analyst at Citigroup, said: “Reducing the maximum stake to £2 would lead to shop closures.” As well as jobs, this would also affect what bookmakers pay towards funding horse racing, he added. Bookies are working hard to avoid this nightmare. They are preparing a new code of conduct on FOBTs, which will allow on-screen alerts for players when they have spent more than £250 or permit them to set spending limits. Industry bosses are due to hold a meeting soon with Helen Grant, the minister responsible for gambling, and are expected to make further concessions. One possibility would be to slow the machines so that players can no longer gamble every 20 seconds. Bookmakers argue that the fears about FOBTs have been overplayed, and that the scale of problem gambling in Britain remains low. The latest Health Survey for England said that problem gambling affected 0.5% of adults. There is unlikely to be any clarity on the government’s intentions until the autumn, when a review of FOBTs is due to be published. Whatever the findings, there is a risk that political expediency will result in some kind of harsh medicine. “The worry is that emotion, not evidence, wins the day because over-regulation can create unintended consequences,” said Richard Glynn, chief executive of Ladbrokes. The question of what should be done about FOBTs has become entwined with another source of concern, the proliferation of betting shops in some areas, particularly inner cities. This month Labour lost a Commons vote on a move to give councils more say over new openings. Figures from the Gambling Commission, the regulator, show that there were 9,031 betting shops in Britain in the year to September, up from 8,822 in 2010 but a long way shy of their 16,000 peak. Some parts of the country have, though, seen an explosion in numbers in recent years. William Hill won an appeal last week to open a site in Newham, east London, after being refused a licence. Opponents pointed out that the borough already has more than 80 bookmakers. The largest chains have said they would be open to a change in planning rules that would make it harder to open outlets. This could mean reintroducing a demand test. In the meantime, the war of words between critics and bookmakers will rumble on. The Campaign for Fairer Gambling, financed by Derek Webb and his partner Hannah O’Donnell, appears to have gained an edge over an industry that has traditionally been pretty savvy on politics and regulation. Webb, who grew up in Derby but now lives in Las Vegas, and O’Donnell have put £500,000 of their multimillion-pound fortune into the campaign. That he made his money from gambling has added a degree of piquancy to the debate. He insists the campaign group, which he started after finding a speeded-up version of three-card poker, a casino game he invented, on an FOBT, is about protecting and educating punters. However, some have questioned whether he also has a commercial motive. He and O’Donnell sold Prime Table Games to Galaxy Gaming in 2011. They each took 1m shares as part-payment. During his days in product development Webb tried to introduce gaming machines for casinos. Prime Table even applied for an American trademark, Vidiceo, for the devices. However, they failed to repeat the success of his three-card poker. This, he insisted, also had no bearing on the campaign. Webb is disdainful of the bookies, and ominously suggests that the fight over FOBTs is just one stage in a much bigger battle. “I am in this for the long haul,” he said.